Just thinking about losing a person you love causes your heart to ache. And when the reality that your loved one can be taken away at any moment finally dawns on you, you’ll find no words for the pain and sorrow. But that shouldn’t be the way you spend a relative’s or a friend’s last days. You should do everything you can to inject love, happiness, and meaning during these precious moments, however short they may be. It’s never easy to approach discussions regarding end-of-life care, but it has to be done. You can somehow lessen the burden by working with renowned agencies like Life’s Journey of Avon. We are a provider of Hospice care in Avon Indiana dedicated to meeting the entire family’s needs during this very difficult time in their lives. Talking about someone’s passing is, in some ways, considered “taboo” is some families. The thoughts death conjures up are just things we don’t want in our heads. However, the truth of it all is that death is an eventuality and it’s something we have to deal with. It’s not going to be easy, but with the entire family on board, and by collaborating with hospice care experts, we significantly increase our chances of remaining whole throughout the entire experience and, more importantly, find acceptance in the situation. So even when it seems like it’s not yours or your loved one’s time yet, don’t shy away from talks of hospice care. At the end of the day, and with all the uncertainties life has to bring, discussing end-of-life care is going to help your family more than you know. Don’t wait until the final days of your loved one’s life before you decide to get in touch with a hospice. Getting it months before would always be the best option. That way, your loved one can receive specialized nursing care, medications, as well as emotional support for a longer time. 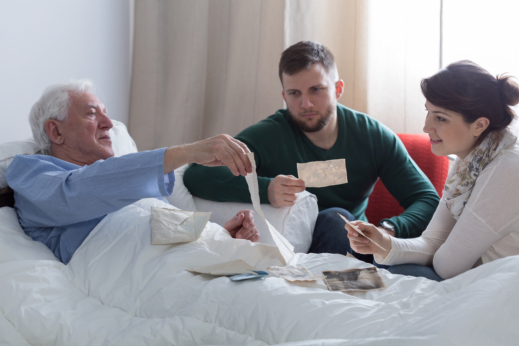 Hospice care offers physical, emotional, and spiritual care, not only to the terminally-ill patient, but also the family members who are stressed, lost and grieving. Pain is often something that characterizes the latter of stages of a terminal illness and a source of the most heartbreaking scenes for family members. We just don’t want to witness the people who are closest to us, who were once vibrant and very happy human beings, barely being able to hang on because of the intense pain they are experiencing. To address this need, renowned providers of Hospice services in Indiana focus on providing pain management and symptom control to bring comfort to ailing patients and their families. Can you tell us your reasons for contacting a hospice care provider? Please feel free to share your thoughts and opinions on the comment section below. This entry was posted in Hospice Care and tagged Comforting, Hospice Services, pain management. Bookmark the permalink.